Iraq’s 2014 national elections are underway. Over the weekend, Iraqi voters residing abroad cast their votes in 19 countries. On April 28, members of the Iraqi Security Forces (ISF), displaced citizens, prisoners, and hospitalized individuals voted in a process known as “special voting.” Over 800,000 voters cast their votes, representing a 91.46% turnout that was described by the elections commission, IHEC, as “surprising.” The turnout varied among different provinces, with Qadesiyah in southern Iraq registering the highest rate of 93% and Anbar being the lowest at 40%. The general public is scheduled to vote on Wednesday, April 30. The special voting was carried out under heightened security measures especially in Baghdad, Ninewa, and Anbar, and curfews were imposed in Ninewa and Anbar. In Baghdad on April 27, Baghdad Operation Command (BOC) announced that the entrances and exits of Baghdad will be closed from 10 pm on April 29, 2014 in addition to imposing a general curfew. They did not provide an end date. The day before, the Council of Ministers announced that official work will be suspended in all provinces (excluding the KRG) for a week starting Sunday, citing a request by IHEC. Also, a captain from the Counter Terrorism Forces (CTF) stated that the CTF will be the security body securing the elections and that forces of the unit started setting up temporary checkpoints in areas of Yarmouk and Hay al-Jamia in western Baghdad. Additionally, the Civil Aviation Authority announced in a statement that Iraqi air space was closed as of noon on Monday until 6 pm on April 30, 2014. In Ninewa, a general curfew was imposed on Sunday but was lifted on Monday after the ballots were closed. Also, the commander of the Ninewa Operations Command, General Mahdi al-Gharawi held a security meeting with commanders of the Iraqi Security Forces (ISF) and IHEC personnel in which the attendees agreed to provide buses to transport voters from their areas to polling stations. A curfew was also imposed in Anbar until further notice. These security measures are enduring characteristics of Iraqi elections days. Nonetheless, Ninewa and Anbar are two of the most unstable provinces in Iraq today. The special voting day was targeted by incidents of violence. At least six attacks carried out mostly using explosive Suicide Vests (SVEST) targeted members of the ISF as they cast their votes. The attacks resulted in the death of at least 24 individuals and the injury of at least 59 others. In Baghdad, an attacker wearing an Iraqi Army (IA) uniform and an SVEST targeted a polling station in Adhamiyah, northern Baghdad killing seven members of the Iraqi Police (IP) and wounding 21 others. Also, an attacker with IP uniform and an SVEST targeted a polling station in Mansour, west central Baghdad killing six members of the IP and injuring 19 others. In Tuz Khurmatu, a similar attack resulted in the death of four individuals and the injury of 11 others. Meanwhile, southern Kirkuk witnessed an SVEST attack on a polling station that left six IP members dead and nine others wounded. In central Mosul, an Improvised Explosive Device (IED) that was followed by an SVEST attack resulted in the injury of five IP members. In Dandan neighborhood of central Mosul, an SVEST attack targeted a security checkpoint near a polling station leaving three members of the ISF injured. In Huz, southwestern Ramadi, members of the IA clashed with three attackers with SVESTs who attempted to target a polling station, killing all three attackers with no reported causalities among the ISF or civilians. Additionally, an IED targeted an IP patrol as it was heading to a polling station in Habbaniyah, east of Ramadi. The detonation resulted in the death of two IP members while five others were wounded. Voters were not the only targets. In Mosul, an IED detonated on a bus that carried media reporters covering the elections in the area of Arabi neighborhood which resulted in the injury of six reporters. In Hawija, west of Kirkuk, an attacker with an SVEST and military uniform attempted to storm a polling station but he was tackled by an IA soldier. The attacker detonated his SVEST killing both. The most casualty-producing attack took place in Khanaqin in which an attacker with an SVEST targeted a gathering of people who were celebrating the appearance of the Iraqi President, Jalal Talabani on TV as he was casting his vote in Germany. The attack took place in front of the headquarters of the Patriotic Union of Kurdistan (PUK) in central Khanaqin, north of Baquba and resulted in the death of 28 individuals and injured 60 others. Two election day irregularities allegations were reported. The first was in Baghdad with regard to the voting of prisoners of the Shaab Tasfirat Prison and the second concerned Anbar refugees in Sulaimaniya. An elections observer in Sulaimaniya, Younis Jasim, stated that most Anbaris in the province did not vote today. He added that the displaced Anbaris were previously notified that they would vote on April, 30th but were only later notified that they were scheduled to vote early. Also, an anonymous observer stated that the administration of Shaab Tasfirat prisons in Baghdad prevented the observers from entering the prison. The source added that the administration pressured and physically assaulted the prisoners to vote “for a certain political party” and that there were 200 prisoners and guards inside the prison “who are voting without the voter cards.” Concerns regarding fraud in prisons were echoed by member of the CoR and the Sadrist Trend Hakim al-Zamili, who stated that the several prisons witnessed violations and that IHEC was notified and that necessary procedures will be taken. Tamuz Organization, a body monitoring the elections, reported that a member of the Da‘wa Party was distributing money and phone cards to voters, apparently in an attempt to influence the voters’ choice. In Najaf, the organization reported that the director of the polling station accompanied the voters in the voting booth. Also, in Baghdad, a Colonel in the IP “educated” the voters to vote for Prime Minister Nouri al-Maliki’s State of Law Alliance. The targeting of the polling sites described above is an indicator that the Islamic State of Iraq and al-Sham (ISIS) will likely attempt to carry out more attacks tomorrow against polling stations in order to disrupt the elections. ISIS attacks will primarily take place in areas that are predominately Iraqi Sunni such as Anbar and Ninewa. ISIS will also carry out attacks in other areas where it control terrain or has freedom of movement and attack such as Baghdad and Diyala. ISF measures have proven effective in past elections to prevent mass attacks, but ISF capabilities will be tested tomorrow given its over 4-month engagement in the ongoing crisis in Anbar and the fact that ISIS and other insurgency groups have in some case been able to outmaneuver the exhausted ISF. Iraqi Shi’a militias and organizations such as Asai’b Ahl al-Haq, the Badr Organization, and the Sadrist Trend are competing in the elections and it will be important to watch if they decide to mobilize their militant members tomorrow to influence voters. The irregularities reported on the special voting day have not generated controversy and that is a good sign. Nonetheless, any appearance of pressure on voters or wide pressure on political party observers will diminish the legitimacy of the elections. The voting tomorrow will be logistically more challenging and therefore the performance of the Independent High Electoral Commission (IHEC) will be under scrutiny. A free, fair, and transparent elections day will be an important start to set the stage for a lengthy government-formation process. 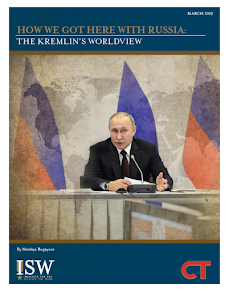 In the run-up to the elections, ISW has been monitoring for potentially inflammatory events that could further deteriorate the security situation or disrupt the upcoming elections scheduled for April 30, 2014. This includes major attacks that have the potential to inflame sectarian tensions and lead to reprisal attacks. Today, on April 25, 2014, a rally of the Sadiqun bloc was targetedby multipleexplosions. The attacks took place at the Sanaa Sports Club on Canal Street in east Baghdad. The three explosions occurred in succession outside the stadium as supporters left the rally. The attacks resulted in the death of at least 30 individuals and the injury of at least 55 others. Early reports are still inconclusive, but the attack appears to have included an IED, a suicide attacker (carried out by either a vehicle or an explosive vest), and a VBIED. The Sadiqun bloc is the political entity affiliated with the Iraqi Shi’a militia group Asa’ib Ahl al-Haq (AAH), a group that ISW has assessed to be active in Diyala and other mixed-sectarian areas in addition to their open participation in combat in Syria. ISW assesses that this attack was most likely carried out by the Islamic State of Iraq and al-Sham (ISIS). The attack fits known patterns of operation for this group, seeking spectacular, high-casualty attacks. ISW has previously writtenon the phenomenon of overt Iraqi Shi’a militia mobilization in mixed areas as a response to attacks by ISIS, specifically stating that “It will also be important to observe if ISIS will attempt to instigate mobilizations of the militias by attacking a major shrine of significance for Shi’a in Baghdad or elsewhere.” In this case, although the target was not a shrine, a high-casualty attack against a gathering of a political group closely affiliated with an active Iraqi Shi’a militia is likely to produce similar effects. Indeed, ISIS-affiliated and sympathetic social media accounts have already begun alleging that AAH has launched a retaliatory attack against Iraqi Sunni prisoners at al-Khalis prison. These reports are unconfirmed, and if true would represent a very dangerous escalation. However, even if false, the spread of these allegations by themselves represent an attempt by ISIS to inflame the situation with the likely goal of disrupting the elections. The Islamic State of Iraq and al-Sham (ISIS) is achieving operational effects upon multiple quadrants of the Baghdad Belts. West Baghdad province, in the vicinity of Abu Ghraib has been effectively besieged by flooding produced by ISIS via the Fallujah dam. 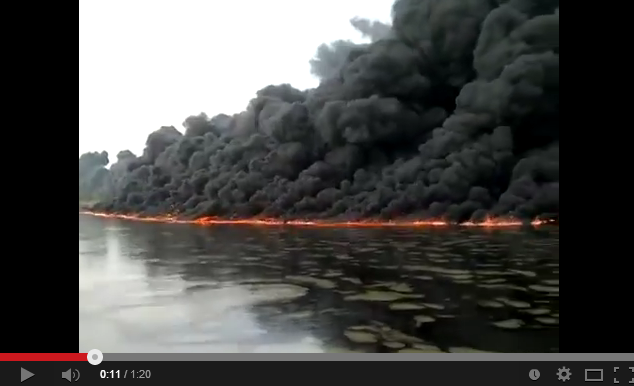 The recent ISIS oil pipeline breach near Bayji also contaminated the water supply to Baghdad. Whether or not these Baghdad effects were deliberate, ISIS has directly threatened Iraq’s capital on the eve of national elections. The increased threat to Baghdad and the accelerated displacement of civilians in Diyala warrant an additional pre-elections warning update. ISIS has likely maintained control of the Fallujah dam since January 24, 2014. Since then, the dam’s 10 gates have been closed and re-opened at least twice. This iterative closure has caused extensive flooding in Anbar province. Flooding has accelerated population displacement initially precipitated by the violent activities of ISIS, tribal revolutionaries, and the Iraqi Security Forces. The civilian population in Fallujah has been displaced to minimum levels as of recent weeks. Now the flooding has caused the displacement of 715 families from Abu Ghraib, according to Iraq’s Ministry of Migration and Displacements on April 24, 2014. The threat of violent attacks was already present in Abu Ghraib before this time. A video posted on March 30, 2014 depicted a military parade by ISIS in Abu Ghraib. On April 3, 2014, Iraq’s Minister of Justice announced that the Abu Ghraib prison had been completely evacuated. In light of these previous indicators of ISIS presence, the displacement of the population from Abu Ghraib may allow ISIS to pre-position in unoccupied buildings, if the flooding subsides. ISW has been monitoring the convergence of ISIS upon historic positions in the Baghdad Belts over many months; improved fighting positions directly enhance their opportunity to launch deliberate attacks upon designated targets in Baghdad. ISIS may also rely upon further flooding to disrupt the electoral participation of Iraqi Sunni citizens in areas that still have good prospects. The extension of the flooding into Abu Ghraib indicates that Baghdad itself may be directly affected by this environmental condition. Abu Ghraib is only 20 km west of Baghdad. 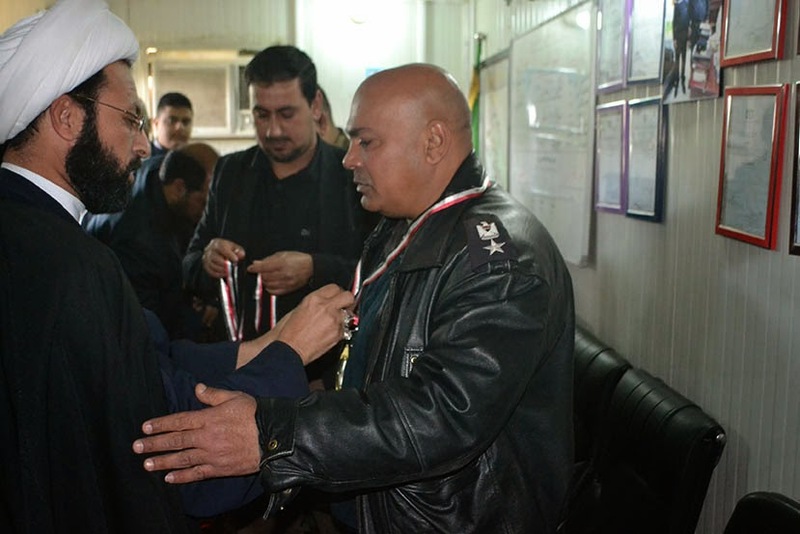 As of April 24, 2014, the commander of the Anbar Operations Command celebrated 460 volunteers who aligned with the Iraqi Security Forces (ISF) because of ISIS dam effects. This begs the question of why the ISF has not yet retaken the dam. The ISF has recently reported new operations north of Fallujah; far south of Fallujah in Jurf al-Sakhar; and continued control of the entrances to Fallujah. With such strong positions, why is the dam still controlled by ISIS? It is possible that the ISF is not able to take the dam by ground force. Recent ISIS activities suggest that ISIS has been moving into areas east and south of Fallujah, such as Yusufiyah, Zaidan, and Zoba, which are southeast of Abu Ghraib and equally near to Baghdad. Near to these areas is Amiriyat al Fallujah, on the west bank of the Euphrates, a village which ISIS attacked again on April 23, 2014. ISIS has been targeting the IP in this area since February 24, 2014, when a report first surfaced that ISIS demanded that the IP in the area “repent.” After heavy clashes, it appears that the ISF, primarily the Iraqi Police (IP), are back in control of the main village as Iraqi Army (IA) helicopters reportedly attacked ISIS positions in Albu Hawa in Amiriyat al-Fallujah on the same day. 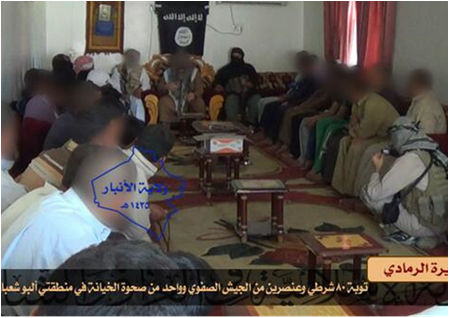 On April 24, 2014, ISIS posted images to its Anbar Wilayat Twitter account portraying a hosted discussion with tribal leaders in Fallujah. 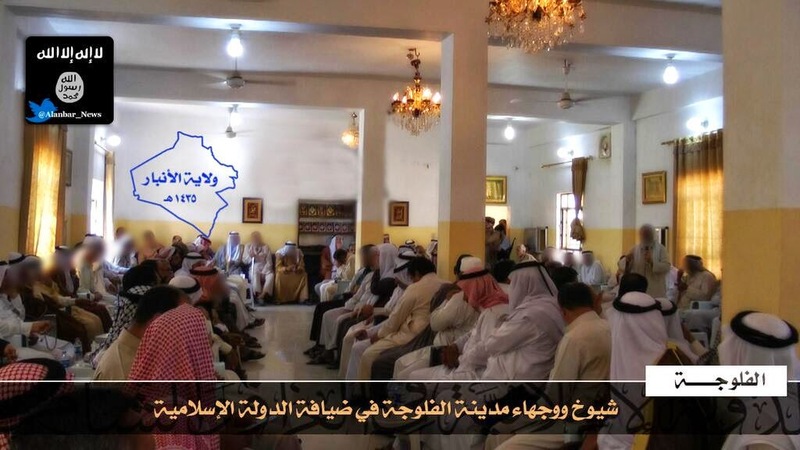 These images suggest that ISIS is still cultivating relations with the tribes, suggesting that cooperation with the Tribal Military Council may now be underway. Additionally, on April 22, 2014, the head of the Sons of Iraq Council, Sheikh Mohammed al-Hayes, still a proponent of the ISF, described the disposition of ISIS in Anbar as the following: Fallujah; Garma and Saqlaqiyah to the north of Fallujah; and Nuaimiya and Amiriyat al-Fallujah to its south. He also described Zoba and Halabsa to the east of Fallujah, as well as villages to the west and specific villages in and around Ramadi. This representation, consistent with ISW’s estimate, places ISIS in a position to advance upon Baghdad from the west. Control of the Fallujah dam, actively wielded by ISIS since January 2014, may be part of a broader operational plan to project operational effects upon the western quadrants of the Baghdad Belts. These are not the only threats projected by ISIS upon Baghdad this week. On April 17, 2014, gunmen detonated IEDs on an oil pipeline near Bayji, causing a massive oil spill that, according to the office of the Ministry of Water Resources, is now flowing toward Thar Thar, and has reportedly entered Baghdad, causing minor damage. But this spill has also contaminated the water supply to Baghdad, such that Karkh will have to be supplied through reservoirs for the foreseeable future. The Ministry projected a water shortage in Karkh that may also extend to eastern Baghdad. This has the potential to generate a water crisis in Baghdad. Several days earlier, the governor of Diyala also stated that Qara Tapa, in northern Diyala, risks becoming “Diyala’s Tuz Khurmatu,” a reference to the extensive displacement of the population in this mountainous corridor. On April 23, 2014, reports emerged that the majority of election workers in Saydiya, nearby, have been threatened from participating in elections. In some places, local teachers have been pressed into service as election workers. With extensive population displacement in two regions of Diyala province, in addition to that in Anbar, it is important to explore where else ISIS is acting upon its announced intent to disrupt Iraq’s national elections, scheduled to take place in six days. Over the last few days, ISIS renewed its threats to teachers on its Wilayat Diyala, Ninewa, and South Twitter pages, discouraging them from facilitating elections. Security in Mosul has been difficult to monitor due to the previous targeting of local journalists by armed groups. Mosul has also seen a recent rise in reported activity. On April 17, 2014, ISIS attacked an IA headquarters with an SVBIED, followed by an armed attack. Then, on April 18, 2014, the traffic police in Mosul went on strike because they have been targeted corporately. On April 20, 2014, ISIS issued the aforementioned warning directed at teachers, threatening them from participating in elections. The same day, the commander of the Ninewa Operations Command stated that a joint IA/Federal Police operation was launched in the western Jazeera desert area of Ninewa, which continues to raise concern over the provision of security by the ISF in Mosul. Ninewa governor Atheel al-Nujaifiheavily criticized the ISF in Ninewa for their performance on April 18, 2014, confirming that the security situation in the province has worsened. Meanwhile, in eastern Kirkuk, an armed attack took place against the polling station in Daquq. The gunmen claimed to be Asayesh (Kurdish intelligence security forces), an atypical technique for the ISIS, and may have belonged to another armed entity. The commander of the 12th IA division claimed that the attackers were in fact Ansar al-Sunna. The attack resulted in the execution of six of the villagers who had been guarding the polling station, which resulted in a clash with local civilians. This event suggests that the milieu of attacking groups targeting voting stations and prospective voters in northern Iraq may include more groups than those operating in Diyala and Anbar, namely ISIS, the Tribal Military Council, and the Ba’athist Jaysh Rijal al-Tariqa al-Naqshabandia (JRTN). In projecting the threat to Iraq’s national elections, it is not possible solely to focus upon Anbar. The threat from Anbar approaches Baghdad. The threat in northern Iraq is now directly affecting Baghdad through its water supply. Security in Mosul appears very poor. Sectarian tension in Diyala may influence the mobilization of Shi’a militias in Baghdad and elsewhere. The sheer number of displaced persons in Anbar and Diyala make it difficult to foresee how the electoral process may be preserved on their behalf. On April 22, 2014, Mutahidun released a statement specifically calling for the attention of the electoral commission, IHEC, to preserve the opportunity of citizens in the Baghdad Belts to vote in the upcoming elections. This underscores their impression that the physical threat is now proximate to Baghdad. Shi’a militias have mobilized in several regions across Iraq, including Diyala, north of Baghdad, and south of Baghdad. The mobilizations began to increase in February 2014, mostly in response to increases in attacks by the Islamic State of Iraq and al-Sham (ISIS). February 2014 also gave rise to an increase in the pre-elections campaigning of various Shi’a political groups. This political mobilization indicates their established presence which allows them an uninterrupted opportunity to campaign in mixed areas without security concerns and possibly with popular acceptance. The current main battle line between ISIS and Shi’a militias will likely form in northern Babel, with ISIS consolidating strength in Jurf al-Sakhar and the ISF and Shi’a militia elements strengthening their defenses in Mussayib and Mahmudiyah. The mobilization of the Iraqi Shi’a militias and state tolerance of their activities will cause further destabilization and disenfranchisement of the Iraqi Sunnis in these areas. Shi’a militia mobilization has been a rising concern since May 2013, when extrajudicial killings and other attacks typical of these groups began to occur at a low level in Baghdad. ISIS has been attacking areas of Shi’a majority in Baghdad and elsewhere since February 2013, essentially without impediment from the Iraqi Security Forces (ISF). ISIS likely aimed to stoke sectarian violence in a manner that would delegitimize and weaken state security. Regardless, signs of overt and mass Shi’a militia mobilization did not occur in Iraq until February 2014. Over the last two months, Shi’a militias have expanded their activities in several provinces beyond attacks against individuals and other social intimidation tactics. Since February 2014, Shi’a militias have begun to attack in villages and urban centers in Diyala and to increase their presence in large numbers through parades and other social outreach north and south of Baghdad. Shi’a militias that may be active in 2014 include Asa’ib Ahl al-Haq (AAH), the Badr organization, and militants affiliated with the Sadrists, all of which are nominally associated with political actors with an interest in Iraq’s elections. This update will document observed instances of mobilization in 2014 in order to isolate that which demonstrates a departure from political process. This update will also identify the Shi’a communities on the front lines of ISIS advance that may seek to augment their community defense in the coming months. These areas will be the subject of enduring concern, where Shi’a militia activities may spark mutual violence among neighboring communities without the intervention of the ISF. One of the first overt signs that Shi’a militias have mobilized beyond extra-judicial killings occurred in the Diyala river valley on February 5, 2014 in the village of Mukhisa. ISIS had been occupying the nearby orchards and displacing families to the point that Diyala Provincial Council member Ahmed Rzoqi and the chairman of the local security commission separately called the area a safe-haven for terrorism in January 2014. The catalyst for the Shi’a militia mobilization on February 5, 2014 was an ISIS attack on a number of security checkpoints, an escalation beyond their recent activities in the area. The local population reported that the ISF responded by moving into Mukhisa. Gunmen in civilian attire reportedly entered the area with the ISF hours after the attack and killed a number of Sunni civilians, surrounding the village and burning a number of homes, while the ISF did not intervene to stop them. The gunmen in this instance likely belonged to Shi’a militias, and if the reports are accurate it is significant to observe the reported ISF tolerance of their targeted violence against Sunni civilians. 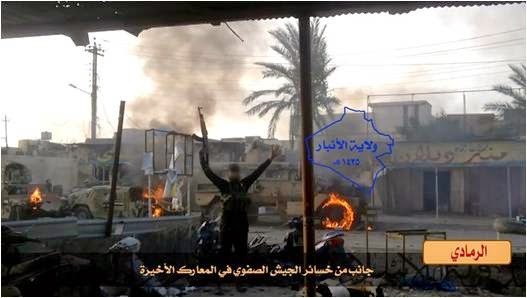 Another ISIS attack prompted a Shi’a militia mobilization in Diyala on March 22, 2014, when members of ISIS took control of parts of Buhriz, a suburb south of Baquba. ISF clashed with ISIS in Buhriz for 48 hours until ISF reinforcements arrived. On March 24, 2014, eyewitnesses from the area reported that “militias” entered the area after the ISF regained control of Buhriz. The militias allegedly burned mosques, grocery stores, and other property while “chanting sectarian slogans.” The residents of Buhriz also reported that members of the militias carried out extrajudicial killings, resulting in the death of number of civilians, including a woman and an elderly man. A video from what appeared to be a surveillance camera in Buhriz surfaced through a Sunni anti-government leaning media account on March 29, 2014. The video dated March 23 showed a number of vehicles and motorcycles of the “militias” entering the area. The same account had posted on March 25 a graphic video of dead civilians who were allegedly killed by the militias in Buhriz. While the surveillance video is not confirmed, such material circulates widely and generates fear among the Sunni population in mixed provinces. The same day, on March 25, 2014, reports indicated that around 30 unidentified gunmen with light and medium weapons and driving 12 civilian “Saiba” cars conducted a parade in central Balad, an area that has a Sunni majority and Shi’a religious shrine. The gunmen were described as wearing black t-shirts, camouflaged pants, and military boots, carrying yellow banners while their vehicles had religious photos and banners. Based upon this description, the gunmen were likely Shi’a militia members. These mobilizations have created a sense of fear among Sunnis living in mixed provinces. This was evident by the mass departure of families from 15 villages around Qarah Tapa in northern Diyala on March 28, 2014, following the Shi’a militia mobilization in Buhriz. The families reportedly referenced the entrance of Iraqi Shi’a militias to their areas after IA forces relocated to more populated areas. This departure reportedly took place after unidentified gunmen, likely ISIS, denied the IA access to major supply routes near Qarah Tapa. Acknowledging the activation of Shi’a militias in Diyala on March 26, 2014, the leader of the Sadrist Trend, Moqtada al-Sadr condemned the recent involvement of Shi’a militias in Buhriz and Diyala. He described those who participated as the followers of the “dictator,” insinuating Maliki’s complicity with other Shi’a militia groups, and the “brazen militias” taking advantage of “naïve” followers of the Sadrists. This is not the first time in which Sadr condemned activities of Iraqi Shia militias, even among his followers. On November 27, 2013 Sadr described a military parade of Jaysh al-Mahdi (JAM) members in Muqdadiyah as “repulsive” and ordered them to dismantle JAM in Diyala. Sadr also expressed his appreciation of a decision by Prime Minister Nouri al-Maliki to act decisively against those who participated in the parade. It is important to point out that these statements are part of Sadr’s pre-elections nationalist rhetoric. Sadr’s spokesperson criticized those who participated in the events of Buhriz, taking care to clarify that participants who carried Sadr’s picture and wrote his name on the mosques they burned were not of his following. It is not clear that the Shi’a militias mobilizing in Diyala represent a single or multiple groups, exclusively Asai’b Ahl al-Haq and the Badr organization, for example; regardless, it is clear that Sadr wishes to be distanced politically from violent behavior. 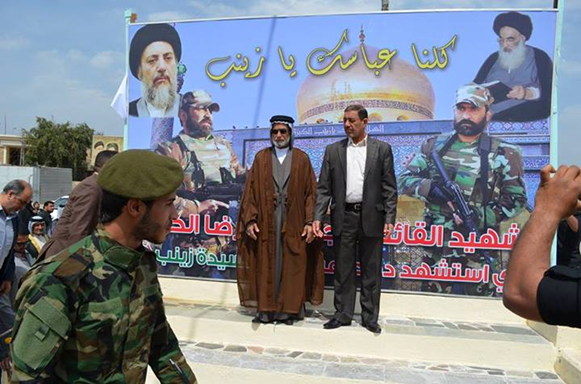 Meanwhile, Sadr’s rival, leader of Asa’ib Ahl al-Haq Qais Khazali has been portraying himself and his group as the defenders of Iraqi Shia with the slogan “Protectors and Builders.” On January 16, 2014, Khazali publically announced engagements with delegations of tribal and notable figures residing in areas adjacent to ISIS support zones. The delegations were from areas within the Baghdad Belts (Abu Ghraib, Latifiya, Madain, Sayafiya, Yousfeya, and Mahmudiya) and Diyala. Both delegations voiced their concerns regarding ISIS and asked Khazali to intervene by supporting the ISF and providing the population with weapons for self-defense. In both cases, Khazali expressed the total support for the population and to the ISF in these areas. While Khazali publically acknowledges AAH involvement in Syria, most recently at an AAH event in Najaf on March 25, 2014, the group has not officially acknowledged violent activities in Iraq. However, a video surfaced on February 28, 2014 depicting AAH members ramping up for an operation, in what appeared to be Anbar province. According to a Washington Post article in late February 2014, an AAH source indicated that members often wear military uniforms on operations outside of Baghdad, including Anbar, which introduces the possibility that AAH is deploying into provinces to counter ISIS. The AAH source was quoted as saying, “The army isn’t well-versed in street fights, so we go, we help them clean it up.” Units within the Counter Terrorism Forces and SWAT teams do specialize in urban warfare and are integral to operations in Anbar, so AAH, if present, is not likely a core element on the battlefield. Nevertheless, the Iraqi Army is already perceived as a sectarian army by Sunni communities. AAH involvement will deepen that perception and increase sectarian tension. It is worth noting that AAH maintains a friendly relationship with the Iraqi Police in areas where they enjoy greater strength. On February 21, 2014, a delegation from AAH’s office in west Baghdad reportedly visited the IP commander in Hurriyah. The delegation presented a “Fidelity Shield” and ribbons to the general in appreciation of ISF efforts to counter ISIS. Also, in early April 2014, AAH hosted an event for IA officers and soldiers as illustrated by the following photo. The exact location of the photo is not clear, but the presence of the commander of the Baghdad Operations Command suggests that the event took place in the capital region. These are critical illustrations of the growing cooperative relationship between AAH, IP, and IA elements in certain parts of Iraq. A delegation from AAH while at an IP station in Hurriyah, northwestern Baghdad. Meanwhile, Shi’a militia activity is likely to increase in northern Babel as Shi’a residents observe ISIS consolidation in nearby Jurf al-Sakhar. On January, 1, 2014, Shi’a residents from the Sindij area of Jurf al-Sakhar departed their area for Mussayib after ISIS started to target them and distributed leaflets urging them to leave. One of the displaced residents stated that the terrorist groups appear at night, killing domesticated animals and shooting in the air and at houses. 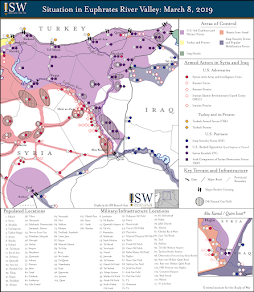 As ISIS became more prominent in this region in early 2014, historically known as the “Triangle of Death,” protesters in Hilla, on behalf of residents in northern Babel, demanded the formation of “popular committees” on March 29, 2014. Popular committees are local security forces endorsed by the government that are formed by area residents. This is the second call in recent months for the formation of popular committees south of Baghdad. Prominent Shi’a figures, including State of Law Alliance member Adnan al-Shahmani and AAH leader Qais al-Khazali, called for popular committees in September and October 2013 after ISIS targeted Shi’a families in Latafiya with explosives planted in houses (HBIEDs). Khazali spoke about popular committees at an AAH event; Shahmani, however, spoke at a press conference at the CoR. 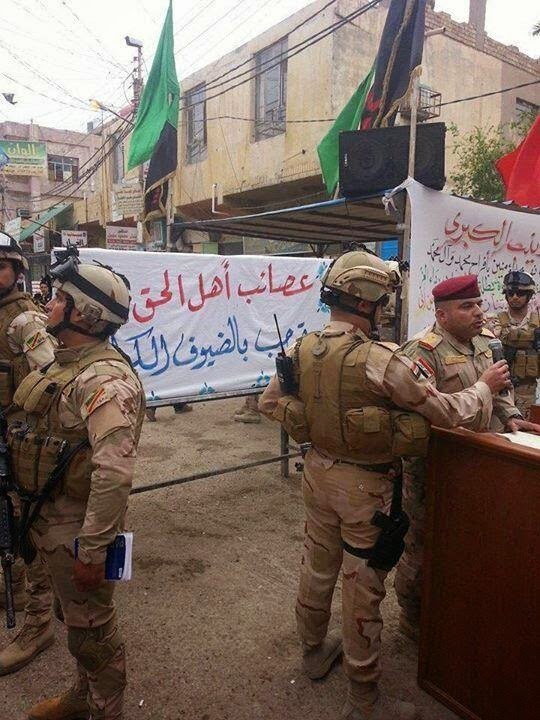 Afterwards banners supporting Shahmani’s statement were posted in areas of Shi’a majority within Baghdad proper, including the neighborhoods of Shula, part of Ghazaliyah , Hurriyah, Kadhmiya, Utaifiyah, and Jkok. The receptiveness of the general public to the idea of popular committee formation to protect Shi’a neighborhoods is an important indicator for how communities in and near Baghdad have regarded their security since. If popular committees are formed in northern Babel, members of Shi’a militias that prosper in areas with demand for protection may assume positions of leadership. It is important to watch if such committees are formed in Baghdad city as well, and other areas where Shi’a and Sunni communities exist in close proximity, like in Mahmudiya and Mussayib. The geography of Mahmudiya, which is surrounded by ISIS zones of support or attack (Jurf al-Sakhar and Buhairat to its south, Yousfeya to its west, and Madain to its east, in addition to Baghdad city to its north) and sits on a major highway, makes it an area of great vulnerability and interest to ISIS. Yet, kinetic engagements have generally been low, reflecting the intense overwatch of the ISF in the area.” Lack of success for ISIS in these areas is likely attributable to the infrastructure established by Badr and other Iraqi Shi’a militias in the area. The district of Mahmudiya, which includes the sub-districts of Latifiya, Yousfeya, and Rashid, has recently shown signs of increasing public presence by the Badr organization. These activities mostly consisted of campaigning by its lead candidate in the area, the director of Badr’s Second Karkh branch, Abu Sadiq al-Mwali. Mwali is campaigning under his real name, Hassan Muhesin al-Sadi. His campaigning included meetings with tribal figures and youth as well as attendance at funerals of civilians and members of Badr who were killed while fighting in Syria. The desire of Badr to campaign in Mahmuduya and the fact that they maintain an office there shows that they have a population that they desire to engage, influence, and most importantly protect. To the right, electoral candidate of Badr and the director of its second Karkh office, Abu Sadiq while at a commemoration of a Badr fighter killed in Syria. Badr has not been the only group to express interest in the area of south of Baghdad. Qais al-Khazali also publically announced an engagement with tribal and notable figures from areas including Mahmudiya, Abu Ghuraib, Latifiya, Madain, Sayafiya, and Yousfeya who voiced their concerns regarding takfiri (Sunni extremist) groups. These figures called for Khazali’s help, stating that they do not have enough weapons. Khazali expressed his total support to the security efforts and to the ISF in an exchange that took place in January 16, 2014. On April 11, 2014 media reports and official statements indicated that unidentified gunmen entered the village of Bodaja, Abara sub-district, northeast of Baquba, opening fire on residents and burning a mosque. According to the report, the gunmen killed 10 individuals and injured two others. Governor of Diyala Amir al-Majmai attributed the attack to “influential” armed groups. On April 13, 2014 Majmai stated that he visited the village and observed the damages to the Haramain Mosque and that he volunteered to fix the structure of the mosque from his own funds. Majmai added that forces from the 20th Iraqi Army (IA) brigade were sent to provide security to the area. He also indicated that “no force” is authorized to enter the village without prior coordination with the IA, likely a message to the Shi’a militias responsible. Majmai also directed that each family be allowed to own a licensed weapon for self-defense. Abara is located east of Khrinabat. According to social media, AAH has a presence in Khrinabat. AAH may not be the only Shi’a militia operating in Diyala, but it is likely that they are active and responsible for some of the mobilized activity observed in 2014. On April 10, 2014 Member of the Council of Representatives from Diyala Salim al-Juburi stated that there are militias and “death squads” operating in civilian and military attire in Diyala. Juburi added that a meeting took place with the Minister of Transportation, the leader of Badr Organization Hadi al-Amiri, to discuss the security situation in Diyala. Juburi added that a “semi-plan” was put together in order to solve the crisis in the province. On April 11, 2014 former governor of Diyala, Omar al-Humairi stated that the increasing activities of the militias will likely generate a reaction of self-defense and that the “patience of our people” will eventually end. While these statements were likely to garner support for these Sunni politicians before the elections, this rhetoric will increase sectarian tension and polarization. Recent attacks by ISIS in Diyala have led to the observation of overt Shi’a militia mobilizations. The close proximity of ISIS attacks to areas of Shi’a majority appears to have prompted the militias to mobilize. Moving forward, overt military activities and public appearances, especially armed parades and armed targeting of Sunni areas will be important indicators of this mobilization. More seriously, if these actions take place with similar tolerance from the ISF as witnessed in Buhriz and Mukhisa, particularly in Baghdad, this will further disfranchise the Sunni population. Concerns by the Iraqi Sunni population in these areas will encourage the expansion of operations by ISIS and the tribal military councils (TMCs) into Baghdad, portraying themselves as the defenders of the Sunnis. Such mobilization and counter-mobilization, without the intervention of the ISF, can easily spiral out of control. It will also be important to observe if ISIS will attempt to instigate mobilizations of the militias by attacking a major shrine of significance for Shi’a in Baghdad or elsewhere. With elections approaching, it is also important to watch for the electoral gains of the political organizations affiliated with the militias. Their political strategies and security strategies are likely linked at a national level, such that gaining influence among local Shi’a communities facing a security threat from ISIS holds electoral promise. Political actors may gain more support from Shi’a populations this way, also potentially discouraging Sunni populations in mixed areas from voting, where the real or perceived threat of Shi’a militia mobilization is a factor. The ability to promise protection may be a decisive factor among competing parties on the final approach to elections. Reflections of the Islamic State of Iraq and al-Sham’s (ISIS) momentum in Anbar increased over the last few days, while the Iraqi Security Forces (ISF) launched operations in Ramadi and Fallujah. The ISF also withdrew from positions in northern Babil’s Jurf al-Sakhar area, a possible indicator that the battle in Anbar may tip in favor of ISIS and other armed groups. The Fallujah Dam continues to serve a battlefield shaping function. It appears that the ISF will soon move to clear Fallujah. On April 9, 2014, Prime Minister Nouri al-Maliki called for an end to the control of Fallujah by gunmen. On April 10, the Iraqi Security Forces (ISF) launched clearing operations in Ramadi and Fallujah, involving shelling in both cities. Subsequent clashes resulted in reports of significant ISIS casualties. The ISF also reportedly clashed with ISIS and tribal elements in Saqlawiyah, Albu Alwan, and Garma, the latter of which remains an ISIS stronghold. Photos on ISIS social media, including the graphic below, indicate heavy ISF casualties as well and numerous abandoned military vehicles and tanks. The fighting in Ramadi and Fallujah is still ongoing, and this update will describe events in Anbar for the intervening period. In Fallujah, clashes on April 10, 2014 followed heavy preliminary shelling by Iraqi Army (IA) artillery elements that led to further displacement of citizens from the already near-empty city. According to an IA official, ISF operations killed 44 ISIS fighters in southeast Fallujah’s Sinai Industrial District and near eastern Fallujah’s Muadhifin Bridge, where the IA 1st Rapid Intervention Brigade destroyed three ISIS vehicles with mounted weapons. Later that same day, ISF clashed with combined ISIS and tribal elements in Saqlawiyah, Albu Alwan, and Garma. Later that night, Iraqi Army Aviation reportedly carried out a rotary-wing strike mission in Saadan, a small village just north of Amiriyat al-Fallujah, which left 11 ISIS members dead. In Ramadi, ISF carried out a series of raids on April 10, 2014 after imposing a general curfew, cutting off communications in the city, and initiating shelling that caused dozens of families to leave. Moving into the city from its southwest quadrant, a joint ISF-Sahwa contingent seized the Haouz Bridge in an attack that left nine militants dead, some of which were foreign fighters, according to an anonymous source in Anbar Operations Command. IA elements later repelled an ISIS assault on the Anbar Provincial Council building in central Ramadi's Industrial District, killing seven militants in the process. Fighting northwest of Ramadi left another 23 militants dead. On April 11, ISIS partially reopened the Fallujah Dam after closing it entirely for a week. Reuters quoted an “anti-government tribal leader” in Fallujah who described the dam's closing as an effort by ISIS to reduce IA mobility. At noon, heavy IA shelling ensued, and the IA 1st Rapid Intervention Brigade continued to inflict losses on ISIS near the Muadhifin Bridge, destroying the fourth ISIS vehicle with a mounted gun system in two days. A special task force from the IA 8th Division with support from IA aviation continued to clash with ISIS in the Saqlawiyah area northwest of Fallujah, killing eight ISIS members and destroying three more ISIS vehicles. Later in the day, an ISIS raid in the village or Rofush in Zawbaa in southern Abu Ghraib left 11 IA soldiers dead and another eight wounded. This attack was notable due to the high IA casualties, demonstrating the ISF’s inability to respond effectively to attacks by armed groups. In Ramadi, clashes continued between ISF and ISIS on April 11, while a joint Iraqi Police (IP)-Sahwa force killed an ISIS leader and arrested six of his assistants in the adjacent Mualmeen neighborhood as they conducted clearing operations in the city’s southwest. Nearby, a joint ISF-Sahwa contingent killed seven ISIS members and arrested six more after clashes in the Iskan neighborhood. Iraqi Police also killed two suicide bombers attempting to detonate their SVESTS on the Maamoun Bridge, which links the Zubaydah and Hamdhiya areas northeast of Ramadi. The continued support of Sahwa and IP in Ramadi remains a critical factor in the overall ISF effort. Clashes continued through April 12, when the ISF reportedly killed 16 ISIS members and seized a cache of Grad rockets and SVESTS in the long-contested Maalab district. Meanwhile, on April 12, ISIS posted photos to Twitter of alleged repentances of ISF members, this time claiming that 80 IPs had defected in the Albu Dhiab and Albu Shaban area north of Ramadi. It would be a significant development for the joint IP-Sahwa element in Ramadi to succumb to ISIS. ISW is watching this indicator especially, because it has been a primary distinction between the battles for Ramadi and Fallujah that the tribes in Ramadi have consistently fought against ISIS to date. Also on April 12, the ISF near Fallujah initiated a failed probing attempt from the northern side of the city and again engaged ISIS in the town of Garma, northeast of the city. The Baghdad Operations Command also announced its intention to establish berms to protect against floods in Abu Ghraib’s Zaydan area, which indicates that the ISF maintains control of that region. 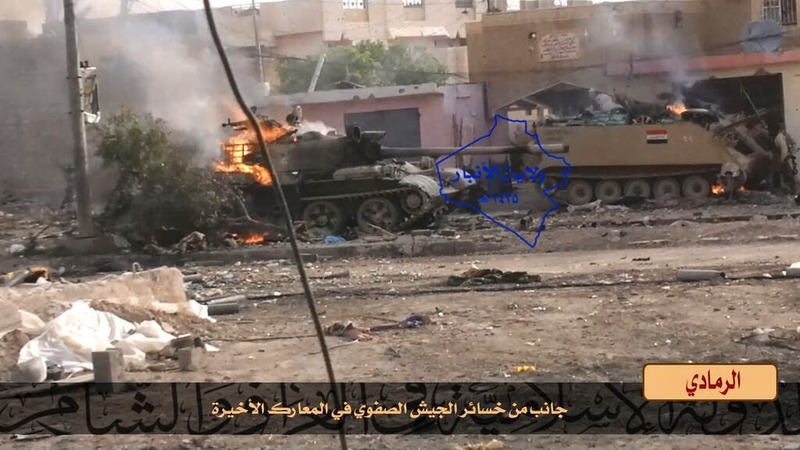 On April 13, ISIS conducted counterattacks, most significantly destroying an IA main battle tank with an SPG-9 in Ramadi according to a military source. It is important to note that ISIS is therefore able to destroy ISF armor capability. 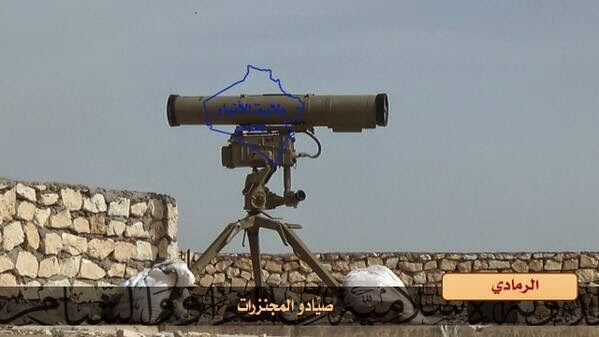 Along with tactically employed SPG-9 recoilless rifles, ISIS also appears to possess an advanced weapon system resembling a Kornet E (AT-14 Spriggan) anti-tank guided missile, based upon an image posted to an ISIS Twitter page. ISIS is also sustaining itself through seizure of ISF arms and ammunition in the vicinity of Ramadi, evidenced in the second graphic below. Additionally on April 13, ISIS reportedly attacked the Muadhifin Bridge along the international highway connecting Fallujah to Baghdad. Bridge attacks and flooding from the Fallujah Dam have likely limited the mobility of IA armored vehicles, neutralizing their utility in the fight for Fallujah. Separately on April 13, the 10th IA Division reported killing a militant named Abu al-Rahman al-Anbari, whom they characterized as a Lieutenant General in the former Iraqi Army now leading an ISIS element. ISW is monitoring for such indicators of Jaysh Rijal al-Tariqah al-Naqshabandia (JRTN) involvement in the battle against the IA in Anbar. In the Abu Ghraib-Jurf al-Sakhar belt, the IA 55th and 60th Brigades of the Baghdad Operations Command killed three ISIS members and destroyed their vehicles near the Tharthar Canal. ISIS also reportedly held a parade on April 13 along the main road connecting Baiji to Haditha. ISW has assessed that this route, a historic support zone for AQI, is a principal north-south passage connecting ISIS elements in the Zaab region to those in western Anbar. This route may also connect ISIS elements in northern Syria through the Ninewa desert to ISIS in Anbar, an alternate route to the Al Qaim - Abu Kamal border crossing, which is contested on the Syrian side by rebel groups and Jabhat al-Nusra. In Fallujah, Anbar Provincial Council deputy chairman Faleh al-Issawi initiated meetings with tribal elders on April 13 in an effort to end ISIS’s control of the dam and reopen all of the Fallujah Dam’s 10 gates to reduce flooding, which occurred later that day. In the evening, ISIS responded to the IA 1st Brigade’s success in eastern Fallujah by detonating a VBIED on the Muadhifin Bridge, a continuation of the group’s bridge-bombing campaign directed at this bridge in order to limit ISF freedom of movement and disrupt its logistical tail. Much of the ISF-on-ISIS clashes observed since April 10 in Fallujah have occurred in the vicinity of this particular bridge, indicating its significance to both sides. On April 14, a source within the Anbar Operations Command reported that ISIS closed the Fallujah Dam again, causing excessive water levels in the mid-Euphrates. This is causing rapid population displacement outside of Fallujah. On the same day, On April 14, after a brief pause in fighting, the ISF resumed heavy shelling and rotary-wing bombardments in outer Fallujah neighborhoods, leaving nine civilians dead. The 1st Rapid Intervention Force reportedly clashed with ISIS in Saqlawiya and Albu Akash and near the Muadhafin Bridge. A source from the Anbar Operations Command stated that the ISF killed 20 ISIS elements and destroyed five ISIS vehicles while fighting north and west of the city. Northeast of Fallujah, the Garma area witnessed fighting in the villages of Albu Alwan and Sijar. South of Fallujah, on the Anbar-Babil border, ISIS assaulted an IA barracks in Rofush village near Zawbaa, the second significant attack in Rofush in several days. According to an AOC source, ISF countered “aggressively” by shelling ISIS positions at the partially constructed University of Fallujah campus south of the city. Further south of Abu Ghraib, North Babil witnessed the relocation of several ISF units away from Jurf al-Sakhar and the replacement of Babil Operations Command leader Major General Saleh al-Maliki with Major General Abdul-aziz Dhalimi. Dhalimi had been the commander of Iraqi Army units in Basra during the 2008 Charge of the Knights Operations. Such moves are likely part of an attempt to complicate ISIS targeting efforts and inject new energy into ISF operations. At the same time, the Federal Police in northern Babel relocated to Mussayib on April 14. ISIS may be working to re-establish its presence in Mussayib and Mahmudiyah, both historic strongholds for AQI. ISW is monitoring for withdrawals and defections from the ISF as principal indicators that the battle for Anbar is tipping in favor of ISIS and other violent groups. On April 15, Justice Minister Hassan al-Shammari announced the successful transfer of over 2,400 prisoners from Abu Ghraib Prison, a recent initiative undertaken after fighting edged eastward toward Abu Ghraib proper. In Ramadi, a brief pause in violence occurred between April 12 and April 14 after slight ISF advances. One attack on April 14 by gunmen in a vehicle struck an IA checkpoint and killed three soldiers on 60th Street in south Ramadi, indicating continued freedom of movement for gunmen along that route. On April 15, ISIS responded to ISF’s push from the southwest with two suicide bombers who detonated their SVESTs at a police station in northwest Ramadi’s Aziziyah district. IP foiled the attack, which only wounded two. In Fallujah, heavy shelling continued on April 15 as the Iraqi Air Force dropped leaflets warning citizens to leave the city “within three days” before intense airstrikes. With the new waves of population displacement caused by floods, very few civilians are left in Fallujah. Those remaining in the city were recently termed “killers and their relatives” by PM Maliki last week, indicating that the government considers those left in Fallujah to be legitimate targets. The leaflets may indicate an impending ISF assault on the city, an operation intimated by Prime Minister last week. ISW has previously assessed that ISF ground operations to clear Fallujah could have consequences including violence reactions by the Tribal Military Councils and further defections from the ISF. The fact that the Iraqi military is announcing this intent and dropping flyers to warn civilians may incur this effect regardless of the operational success of the ISF. An important consideration will be the enduring ability of the ISF to maneuver with armored vehicles in the vicinity of Fallujah. The ISF may be facing new counter mobility obstacles caused by ISIS bridge attacks and flooding. The withdrawal of IA elements from Jurf al-Sakhar is a worrisome sign that the IA cannot hold in the low-lying areas south of Fallujah. Increased clashes between the ISF and ISIS will continue as the April 30 elections approach. For ISIS, its previous employment of anti-election intimidation presages a push to posture itself for disruption of Iraq's critical elections moment. On the other hand, Maliki has chosen to center his electoral campaign on his ability to provide security for Iraq and targeting ISIS. Given that Maliki has staked his electoral campaign upon a mandate to provide security, ISF losses in Anbar will likely cause him to re-double his security strategy. Thus, impending elections may prompt the worsening of security situation in Anbar. Richard Berger and Kevin Truitte are Iraq Project Research Interns at Institute for the Study of War. ISW is issuing a second Warning Intelligence update concerning ISIS in Iraq based upon the following indicators emanating primarily from east Anbar. On April 6, gunmen closed the Fallujah Dam. This attack, assessed to be a response to recent ISF operations, caused flooding in Zoba, Hamid al-Shaban, and Inaz IVO Fallujah, forcing IA elements to relocate. The Ministry of Water Resources warned of possible flooding in Fallujah and Saqlawiya as well. The closure of the dam has caused a severe water shortage in Mussayib and other cities IVO Nasiriyah. The Director of Water Resources in Dhi Qar voiced concern over the potential closure of the Nasiriyah Thermal Power Plant as a result. The IA announced the intent to launch a military operation to recapture the dam. As on April 8, the dam has apparently reopened, and no new IA offensive was launched. On April 9, Prime Minister Nouri al-Maliki stated that the Iraqi government must act in Fallujah in light of the recent closure of Fallujah area dams by gunmen likely affiliated with ISIS and the Tribal Military Councils. In his statement, Maliki directed his remarks to the international community and added that the issue has become “more dangerous and bigger for us to bear and we will bear the responsibility for removing this injustice.” By addressing the international community, Maliki is attempting to preempt any criticism against a possible military operation in Fallujah. Furthermore, Maliki added that the recent actions by the anti-government armed groups in Fallujah is akin to Saddam Hussein’s behavior. Maliki’s statement was followed by a statement from the Iraqi Foreign Ministry stating that the government “has a constitutional responsibility” to restore security to Fallujah. Politically, the statement comes after an April 8 meeting of the Pan-Iraqi Shi’a National Alliance, which condemned the closure of the dams and called on Iraqis to unify and support the ISF in its “war against terrorism.” If Maliki decides to launch a wide-scale military operation in Fallujah, the meeting and its statement provide him with the political support he needs. ISW is also monitoring Shi’a militia mobilization north and south of Baghdad. On March 25, a group carrying yellow banners and religious photos conducted a parade in Balad, likely a Shi’a militia responding to the incendiary ISIS offensives in Buhriz, Diyala and the Nebai area north of Baghdad earlier that week. On March 29, elements of the population in Hilla called for the return of popular committees. This follows recent indications of mobilization in Najaf and raises concern over the Shi’a militia presence ISW assesses that Mussayib is the site of strong Shi’a militia presence, poised to form a barrier against ISIS advances south of Baghdad, making them a likely target for ISIS to incite broader sectarian violence. ISIS named a wilayat of “the south” among its other governorates, and ISIS control of nearby Jurf al-Sakhar has been a growing concern for several months. There may also be an emerging threat within Baghdad. A hashtag referring to the “Grand Battle of Baghdad” is circulating among ISIS-leaning Twitter accounts. A wave of eight VBIEDS detonated in Shi’a neighborhoods in Baghdad on April 9, 2014, consistent with previous patterns, and ISW is monitoring for further escalations in Baghdad to disrupt national elections scheduled for April 30, 2014. Elsewhere in Iraq, ISIS recently posted a reference to “directed IEDs” on the Twitter pages of its wilayat in Salah ad Din. 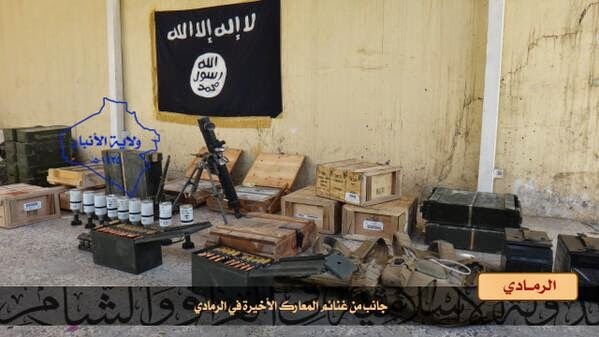 A photo posted to the ISIS Wilayat Kirkuk page at the beginning of April 2014 displayed large shell casings that appear consistent with rudimentary EFPs. ISW is monitoring for further indications of EFPs in the handles of ISIS on the battlefield. ISW will continue to monitor the situation.